Crowned female holding staff and statue of Victory, Stockholm Olympic stadium in background, panal with 7-line Swedish award legend below. Surrounded by flower and laurel leaf border. In accordance with the general regulations of the Olympic Games, every prize-medal had to be accompanied by a diploma. In addition to this, it had also been determined that every competitor, other than a winner, whose performance was of pre-eminent merit, should be presented with a special Diploma of Merit. Such diplomas were also promised to every non-winner in the Marathon Race and in the Cycling Race round Lake Mälar, who passed the winning-post within the winner`s time plus 25 %. 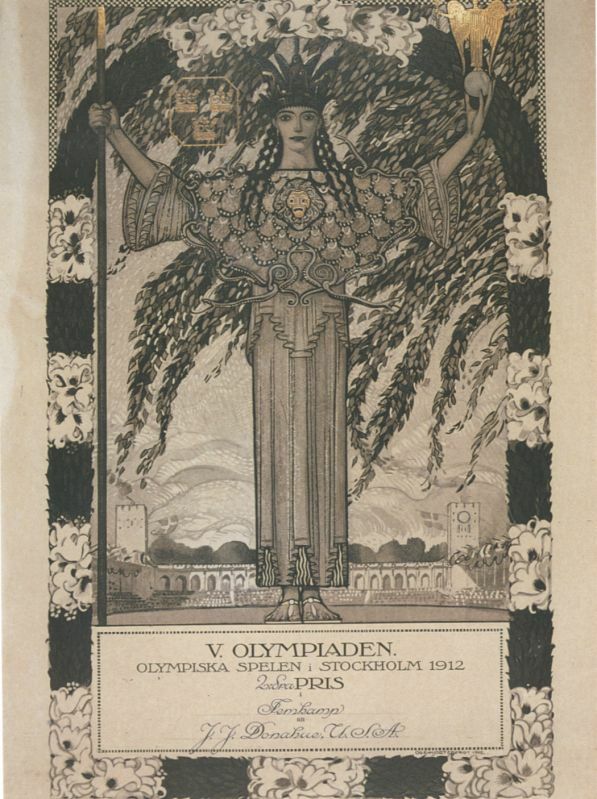 In August, 1911, Professor Olle Hjortzberg, of the Royal Academy, was requested to make a design for the Olympic Diploma, and in the middle of March, 1912, a number of different designs were laid before the Swedish Olympic Committee, of which the Committee approved of, and accepted, one representing the goddess Pallas Athene, with, in the Background, the Stadium, in which a gymastic display is being given. In her right hand the goddess holds a staff and, in her uplifted left hand, the Greek symbol of victory. The Commemoration Diploma: presented to all the principal Associations represented at the Games, to the members of the International Olympic Committee, and to the leading personages in the various national Olympic Committee. The Diploma for Meritorous Work: presented to the members of the Swedisch Olympic Committee and to the presidents and secretaries of the special committees. The Contractors Diploma: presented to the firms, etc., that had meritoriously carried out the contracts made with the Swedish Olympic Committee and the Stadium. Altogether, some 2,000 diplomas have been awarded.